"The new Quietex™ Bumper is a sound and vibration dampening clear bumper. 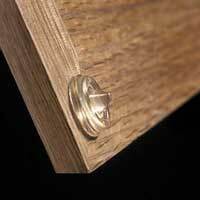 This revolutionary urethane bumper was designed to significantly reduce the noise of cabinet and vanity door closings. The sound dampening materials used for this bumper, combined with the physical design, softens the remaining sound by trapping it within the bumper. It is the ideal choice for cabinet and vanity doors where sound and vibration dampening properties are desirable and long life is required. The Quietex� Bumper significantly outperformed every other bumper on the market in laboratory tests." I think I should buy these for my upstairs neigbors who are constantly slamming their cabinet doors in the kitchen.